On November 27, 2012, Dr. Victoria Ashiru led her Labor Relations class on a field trip to the AFL-CIO Headquarters in Washington, DC. The American Federation of Labor and Congress of Industrial Organizations is the umbrella organization of 56 U.S. labor unions, which collectively represent about 12 million Americans. AFL-CIO’s Facilities Manager, Mr. Zobrisky, served as tour guide to the VIU students and explained the history of the union as well as its current challenges with employers and the legal system. He also shared the history of the building and every single one of the 42 conference rooms that hold over 4,000 conferences a year. 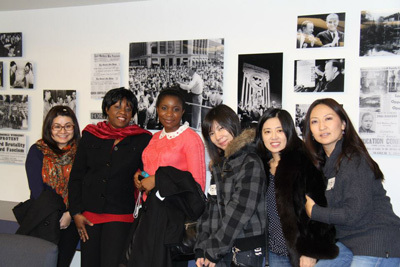 After their visit to AFL-CIO, Dr. Ashiru treated her students to a scrumptious lunch at the International Monetary Fund. All the students very much enjoyed their real-world lecture. “I am greatly thankful to Dr. Victoria Ashiru, who is committed to excellence through teaching our diverse student body. At Dr. Ashiru’s special invitation, my HR classmates and I visited the AFL-CIO office and the International Monetary Fund, both in Washington, DC, on November 27, 2012. We were privileged to learn about the history of the labor unions as well as the physical AFL-CIO office and all the conferences held yearly at the facility. We had the opportunity to ask our tour guide questions regarding the challenges faced by the labor union. After the tour, Dr. Ashiru surprised us with a lunch at the International Monetary Fund. “The Labor Relations class was a very interactive one. At the beginning, it seemed to me we were talking basically about unions which I did not think were very active or relevant today. Dr. Ashiru changed my views and got me interested in the subject by getting us to work on current events such as the Chicago Teachers’ strike and Walmart labor relations issues. 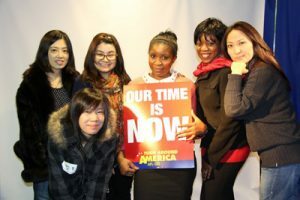 Dr. Ashiru went further by taking us on a trip to AFL-CIO to get a first-hand idea of what the union really is. Our tour guide, Mr. Zobrisky, discussed the history of the union and its current state today. It was also a fun trip as we all had fun taking pictures all around the union building. I wish we did not have to leave, but I am sure I will make the trip again with the next Labor Relations class. “I had a great time on our field trip to AFL-CIO and the IMF. It was like dream come true and that particular experience has changed my attitude toward the labor union. Honestly, in my view, the union in my home country, Thailand, was characterized as a third-party organization. After this visit, I realized the importance and relevance of the AFL-CIO and how they fight for the right of every employee and to achieve equality for everyone. The trip to the IMF was totally unexpected and for that I am very grateful.